On June 9, Benedictine Sister Heather Jean Foltz professed first vows as a member of the Sisters of St. Benedict of Our Lady of Grace Monastery in Beech Grove. The temporary vows of stability in the monastery, fidelity to the monastic way of life and obedience according to the Rule of St. Benedict further incorporate Sister Heather Jean into the life of Our Lady of Grace Monastery as she prepares for a possible future perpetual profession of vows. 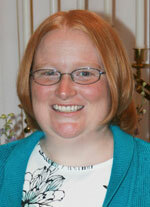 Sister Heather Jean is the daughter of Paul and Christine Holtz of Dyer, Ind. She is a graduate of the University of Indianapolis and worked at Horizon House, a homeless day facility in Indianapolis, before entering Our Lady of Grace Monastery in 2008.